Paul Graf Real Estate & Contents Auction — Harritt Group, Inc.
Mid-century one level Bedford stone ranch with attached garage on .367 acre lot in established neighborhood located off Green Valley Road and Daisy Lane near State Street medical & shopping corridor. 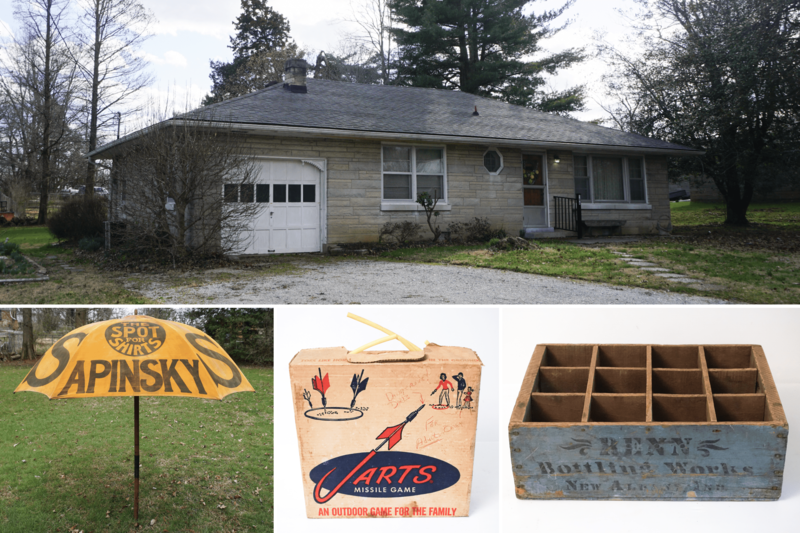 Also selling live on site the lifetime antique collection including furniture, industrial & primitive antiques, art, advertisement, glassware, household, mower & tools. Paul a local authority on New Albany history, and his late wife Norma are the former owners of Catty Corner Antiques. Plan to attend – should be a great auction! Charming 1,092 square foot 2 bedroom – 1 bath Bedford stone ranch with attached one car garage on 100’ x 160’ lot located off Green Valley Road near medical, shopping & expressway. This one-level home built in 1953 features a large eat-in kitchen, equipped laundry/mud room, hardwood floors, cedar closet, oil furnace and central air. Great potential for a homeowner or investor, selling with below-market reserve! 10% Non-refundable down payment due day of auction, balance due in 40 days. Taxes prorated to day of closing. Immediate possession. Selling as is with no contingencies, all inspections welcomed prior to auction. Hoosier cabinet with porcelain top and flour bin, round oak pedestal dining table with claw feet, oak pedestal coffee table, Globe Wernicke barrister bookcase with no doors, cherry dining room suite includes buffet, china cabinet and dining room table with chairs, secretary desk, (4) cane oak bottom chairs, mahogany secretary bookcase, student chair, cedar chest, Victorian furniture includes rocking baby cradle, rocking chair, lounge chair, love seat and washstand, two door primitive cupboard made from Wainscoting, marble top lamp table and more, (3) piece maple bedroom suite with bed, dresser and chest, antique high chair, clothes tree, child rocking chairs, vintage wood inlaid card tables, modern cloth sofa, armchair, picnic tables and more. Vintage Fuzzy Zoeller portrait bust – a career highlights plaque – featuring all of his notable earnings including the Masters and US Open. Made by Bruce Fox – originally hung at the New Albany Country Club. George Morrison Limited Edition print #101 of 200 commemorating New Albany’s Bicentennial 1813-2013, (10+) framed Victorian lithographs, oil on board covered bridge painting, (2) Currier & Ives framed prints, original Virginia Biggerstaff artwork, Gone With The Wind double globe hand painted oil lamp, Aladdin electrified oil lamp with metal base and pink font, several ornate electric lamps, (6) Hummel figurines, green Roseville large pinecone jardiniere 402-8, Kerry Zimmerman paperweight, Zimmerman ashtray marked Dr. Hess, blown glass paperweight, White Mountain ice cream freezer maker,Billy Herman memorabilia, folk art scoreboard, Mohammad Ali & Fuzzy Zoeller autographs, Little Brown Jug thermos, tinker toys, cigar boxes, picnic basket and plates, stoneware crocks, spongeware bowls, dough bowls, Bruce Fox birddog cigarette and matchbox, 1974 IH iron cadet figurine, dozens of vintage books including History of Jackson County – 1881, Indiana It’s History – 1925, Jungle Book Vol 2, Sinking of the Titanic, The Fall of Pompeii, Manual of the Holy Catholic Church – 1906, framed photo of the Ordination of Cardinal Ritter, New Albany High School Vistas, pitcher & bowl set, Belknap inventory book, pocket knives, salt crocks, large selection of costume jewelry and watches, buttons, vintage purses from the Cora Jacobs estate, several blue mason jars, vintage LP records, large amount of vintage golf clubs, vintage sport trading cards including (34) 1933 Big League Chewing Gum trading cards, several unopened 1990’s trading cards in their original boxes, several Billy Herman framed cards, 1934 Kelloggs Baseball Sports Library book and much more. Large selection of galvanized wash tubs, buckets, sprinkler can and more, iron metal milk crate, metal gas can, ornate coal hole cover, large selection of oil cans, dozens of berry handies and baskets made by Paul Graf, pie safe doors, Von Allmen Brothers milk can, kraut board, iron kettle, antique tool caddies, Griswold cast iron dutch oven, (3) Wagner cast iron skillets, dutch oven, primitive animal cage, wood wagon wheel, iron implement wheel, primitive wood bench & wheelbarrow, Victorian wrought iron fence, 600+- glazed star paving bricks, Hoosier New Albany Indiana bricks, (2) limestone cistern rings, (8) vintage grindstones, concrete yard art, limestone & iron boot scraper and more. Vintage Renn Bottling Company New Albany blue painted wood case, several Renn bottles, large Albert Schmidt porcelain sign, vintage SAPINSKY clothing advertisement umbrella from New Albany, local retro political signs, round Coca Cola thermometer, multiple paper Bluegrass signs, retro Falls City beer cans, Calumet baking powder tins, wood soda crates and more. (13) 1964 Kennedy half dollars, (1) 1944 Liberty silver dollar, (3) silver quarters, (30+) Buffalo nickels, (2) 1973 6 coin proof sets in original boxes, (2) 1972 5 coin proof sets in original boxes, (4) 1973 7 coin proof sets, Kennedy half dollars, wheat pennies, mercury dimes, (2) Eisenhower proof dollars, uncirculated Carson City silver dollar. 80+ pieces of pink depression glass, hand painted china, candlesticks, pitcher and bowl set, covered cake stand, pressed and cut glass, opalescent glass, 71-piece Noritake Green Bay china set including (9) 7-piece place settings, dozens of glass figurines, MA Hadley casserole dishes, Louisville stoneware dishes, retro salt and pepper shakers, beer steins, shot glasses, Pyrex dishes, Pfaltzgraff dinnerware and canister set, late model Derby glasses, Coca Cola glasses, juice glasses, pots, pans, baking dishes and much more. Snapper riding lawn mower, push mower, large selection of hand, yard and power tools, ladders and much more. I-265 to State Street Exit #1. South on State Street to left at light on Daisy Lane. East 4/10 mile to left on Green Valley Road. 1/10 mile to right on S. Bohannon Lane to auction on right.